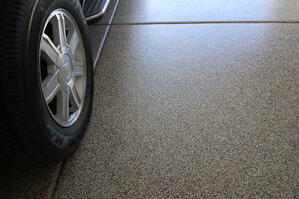 In recent years, epoxy floor coatings for garage floors have become popular. Combining form and function, they both protect the garage floor from damage and make it appear more attractive than it otherwise would. If you're considering putting in an epoxy floor coating, learn what to expect in terms of installation and maintenance, as well as the benefits of doing this type of floor coating. With an attractive look and feel, epoxy coatings are the perfect choice for commercial or residential garages. As these floors are customizable by color, you can select from a wide palette of solid colors or blend your own color. Since the epoxy itself goes over the existing floor as a coating, and then cures, the end result is much firmer than a typical coat of paint. This ensures the epoxy floor coating will really stand up to wear and tear. Plus, you can easily wipe up most stains and spills without worry of penetration. If your cement garage floor is covered with oil spills, you'll enjoy this. To ensure the epoxy properly bonds with the floor, your garage floor installer will spend a great deal of time preparing the surface. From moving items stored in the garage to patching cracks in the cement, your installer will take care of this. The cement will also need to be properly prepared so that the epoxy can bond with the floor. This is often done by acid etching or floor grinding; your installer will choose the best method for your situation. Once the surface is prepared, the installer will apply a primer and then multiple coating of epoxy, allowing the surface to dry in between. A clear top coat protects the color and adds shine. In many cases, the job typically takes 4-5 days, including drying and curing time. Of course, a cluttered garage can take longer as there will be more items to move. These floors are low maintenance. Most spills and stains can easily be swept or mopped and will not leave a trace on the floor. Some styles of epoxy floor coating can be slippery when wet. Your installer can advise you whether the color you choose will be slippery when wet; in this case, you may prefer to have a slip-resistant coating applied to minimize your labor. 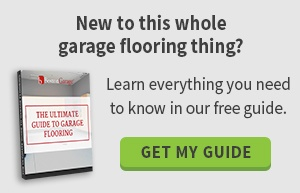 At Boston Garage, we are specialists in garage floor coatings, including epoxy coatings. Our staff is happy to discuss this type of project with you, schedule an appointment, or provide an estimate free of charge so you feel fully informed in making this decision.